No matter what the animal psychologists, behaviorists, veterinarians, and crazy cat ladies try to tell you, there is one simple, immutable truth about cats: They're weird. Okay, they're also soft and fluffy, but they're mostly just weird. Just when you finally think you understand your cat, he or she will attack your ankles or decide the cat food you've been buying for the last six years suddenly isn't good enough anymore, and will you please take all 36 cans you just bought three days ago back to Petco and exchange it for something else, thank you. So does anyone really know why cats do the things they do? Not really, but veterinarians like to at least make educated guesses. And one of the biggest burning questions about cat behavior is this one: How come sometimes your cat turns into a soft and fluffy version of the Incredible Hulk when you're in the middle of what you thought was a bonding moment? According to VetStreet, cats who bite the hand that pets them probably don't do it for no reason, even though it seems like that's what just happened as you're standing there in a wispy cloud of cat hair watching the blood seep from your hand while Kitty retreats to the opposite end of the house. Owners call these "love bites," but vets have a much more sociopathic moniker for the behavior: "petting-induced aggression." Signs of petting-induced aggression include biting while being petted, and staring evilly at sleeping humans from dark corners of the room. There are a few theories about why some cats might do this. Kitty might be getting a small taste so she'll know what spices to add to the pot after she finally gets around to murdering you in your sleep. That one isn't generally accepted by veterinary professionals, though. Really, she may be trying to control the situation. The ancestor of the modern house cat was probably a solitary animal, so the whole social hierarchy thing is still pretty new to her. Your cat may reach a point during that moment of shared affection where she thinks, "I can't let this person think I'm actually domesticated or anything, I'd better just bite him." That might not explain all petting-induced aggression, though. Another theory is that some cats might actually experience prolonged petting negatively, and the biting is a reaction to that. It could be that petting actually starts to feel physically irritating to the cat when it's overdone. So maybe it literally just rubs the cat the wrong way. 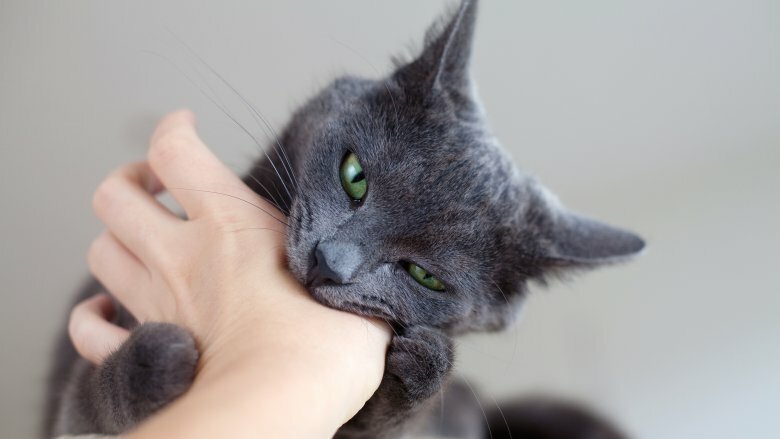 Biting could also happen when a cat gets excited and decides the petting session should turn into playtime. Cats are predators, after all, and they hone their hunting skills by batting Legos around on the floor, ambushing your ankles when you're on your way to the bathroom late at night, and possibly by biting you while you're trying to show affection. So if your particular brand of petting leans a little on the aggressive side, your cat could just be responding to that in a totally natural way. One final theory is that the sudden switch between enjoying the moment and thirsting for blood might not really come without warning. There could be subtle cues that the pettee is no longer enjoying the interaction, but they may be so slight that some petters just don't notice them until it's too late. So what should a cat owner do with an animal who suffers from petting-induced aggression? Well, no one is saying these cats are a lost cause — it's really just a matter of learning how to tune in to the animal's mood so you can predict when a petting session might turn into a bloodbath. That could mean just taking note of how long your cat will usually tolerate petting before doing the whole Heisenberg thing, and then making sure you always stop well in advance of that time limit. Or look for those subtle cues, like a flicking tail or flat ears. Most of all, though, wear boot slippers and make sure your spices are locked up. It's the only way to be sure that petting-induced aggression doesn't evolve into something much, much more sinister.